Having a roofing system on your home that is failing can lead to all sorts of problems. Once a roof starts to leak it can damage many of the items and components on the inside of the home. Even if the roof leak is rather small and not noticed on the inside of the home it can still lead to problems such as saturated insulation and even mold growing in your home over a longer period of time. For home owners that need roof replacement in Fowlerville Michigan however we can help. At Livingston Roof Pros we can help put your home back to good with roofing replacement on a variety of roofing materials. One of the bigger problems when it comes to roof replacement in Fowlerville Michigan is that many people don’t really know their roof is in bad shape. After a roof leak begins on the home it may become quite apparent but it may be too late and the interior of your home can be damaged. 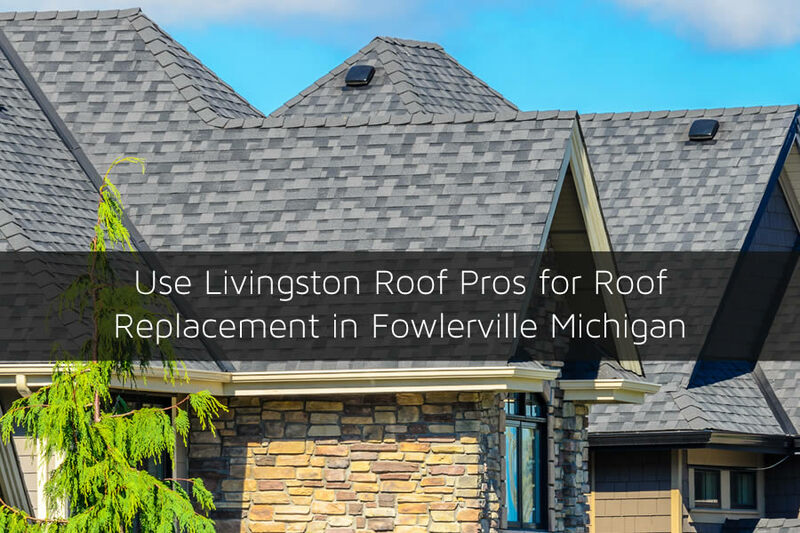 At Livingston Roof Pros we offer a roof inspection in Fowlerville Michigan to help you determine the shape of your roof and locate any problems. Sometimes a simple roof repair is all that is needed to keep your home protected. In either case, you’ll need a professional roofing contractor in Fowlerville Michigan to do roof repairs or roof replacement in order to get the best possible outcome from your project. We are the best roofing contractor in Fowlerville Michigan and do everything we can to ensure your are completely satisfied with the work we provide. Listed below are some of the reasons why we’re your best roof replacement choice in Fowlerville Michigan. As you can see we service almost all roofing materials that are used in Fowlerville Michigan today. Plus, with each roofing material manufacturer we also hold certifications with them. With the popular roofing choice asphalt shingles manufacturer GAF we are a Master Elite Roofer holding one of their highest qualifications. The reason this is so important is that you’ll need to ensure the products are installed correctly on your home’s roof. Improper installation is one of the top reasons why a warranty is void on a roof and also one of the top reasons why the roof fails later. We always make sure the products are installed per the manufacturer’s guidelines. This may take longer and cost us more but it’s the right thing to do to make sure you get the best roof possible on your home. All of the work we do on a roof has our guarantee that it won’t leak. We stand behind all of the work we do and strive to do everything we can for our customers to keep costs low and also give them a quality service and end product. If you’re not satisfied with any of the work we’ve done be sure to let us know. We’ll do everything we can to make it right and keep you satisfied with our service. We’re not a fly-by-night company, we’ve been part of this community for years and will continue to be here for years to come so if you don’t need us now, we’ll be here when you do. We also have several options that can save you money in Fowlerville Michigan. We offer both re-roofing and complete tear off installation of a new roof in Fowlerville. Talk with one of our roofing experts to learn more about these options and how we can save you money on your roof replacement in Fowlerville Michigan. Ready to get started on your roofing project or just need a roofing inspection on your home’s roof to determine what shape it’s in? Give us a call today at Livingston Roof Pros at 517-940-8770 or fill out our quote form on the website for more information.